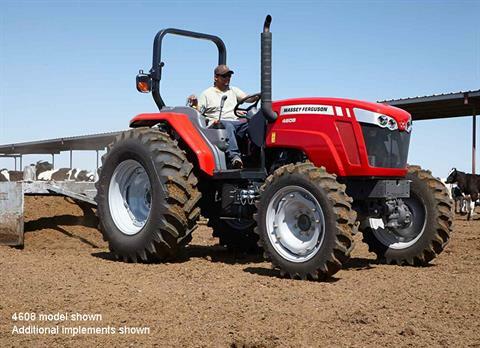 Our Massey Ferguson®4600 Series makes loader and hay work easier than ever. Our 4600 Series provides exactly what livestock farmers have been asking for: an affordable utility tractor that‘s powerful, versatile and comfortable. At its core is a new hydraulic power shuttle transmission. During loader work, it lets you go from forward to reverse and back again without clutching – saving constant stress and strain so you can be more productive. Each model is also Tier 4i compliant: Using electronic engine management, our 3-cylinder engine is both powerful and fuel efficient, without the need for regenerating particulate filters. CAPABILITY: Perfect for livestock farming, dairy, hay, and general all-around farm work, these exceptional 2WD and 4WD loader tractors save time, effort and fuel. QUICK-ATTACH LOADER: Front end loaders feature quick-attach design that makes removal (and reattachment) a snap. MAINTENANCE-FREE EMISSIONS SYSTEM: It keeps emissions low, preserves power, plus there's no Diesel Particulate Filter to regenerate, saving you time and fuel. HIGH & MIGHTY: The 4WD front axle design provides a high ground clearance to straddle heavy windrows and a high steering angle for maneuverability. COMFORT: From the standard loader joystick to easy ground-level refueling, this tractor is designed with you in mind. OPEN AIR OR SPACIOUS CAB: Choose an open station platform or enclosed cab - both with a completely flat foot deck with rubber cover and plenty of foot room. CONVENIENT CONTROLS: Tilt steering and an intuitive layout of controls makes your day more productive and comfortable. SUSPENDED SEAT: This fully adjustable and suspended seat with armrests and retractable seat belt makes long days in the saddle comfortable. INNOVATION: The 4600's 3.3L turbocharged engine is the strongest production 3-cylinder off-road diesel in the world today. In fact, this tractor is loaded with innovation. ADVANCED 3.3 LITER 3-CYLINDER ENGINE: Our AGCO Power diesel engine has 4 valves per cylinder, electronic engine management & meets Tier 4i emissions standards. BEST IN-CLASS HYDRAULICS: Exceptionally high hydraulic flow means faster cycle times for loaders and other hydraulic implements. ENHANCED POWER SHUTTLE TRANSMISSION: The power shuttle transmission with 12 forward and 12 reverse speeds standard lets you go from forward to reverse repeatedly - without clutching.